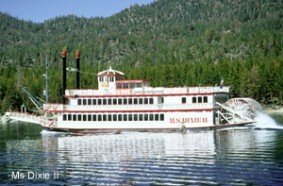 The MS Dixie of Lake Tahoe is a Paddlewheel boat that features “The Sunken Treasures of Lake Tahoe” video and glass bottom viewing. Departing from historic Zephyr Cove, the M.S. Dixie II has been voted “Best Boat Cruise” at Tahoe for ten years running and hosts a historic breakfast buffet, scenic champagne brunch, dinner, dinner/dance cruise and sightseeing cruises. Choose your Lake Tahoe cruise package and book today! This two-hour narrated tahoe boat cruise offers non-stop photo opportunities to the crown jewel of South Lake Tahoe – Emerald Bay. As you cruise to, through, and back from Emerald Bay, you’ll learn how it was formed and some of its fascinating history with a special video presentation. If you get hungry while you’re on the cruise, you can purchase a lunch and there’s also a complete bar service available. Sailing off into the sunset, you’re on your way to a magical evening of dinner, dancing, and starlit strolls. A narration featuring intriguing stories about Fanette Island and Vikingsholm, will whet your appetite for a four course meal with entrees such as Angus beef top sirloin or macademia-crusted mahi-mahi. There are cocktails and wines available for purchase as well. Dance the night away featuring Safari playing hits from all eras.